Last week’s unprofessional and nonsensical article in the Atlantic demonstrates the media will avoid evidence and facts at all costs to defend terrorists and apologize for the Global Islamic Movement. The bright side of the American media’s collusion with our enemies is that they are so overwhelmingly stupid, they expose themselves, making it easy on the rest of us. From shortly after the MB’s founding, Muslim Brothers were being arrested and executed by the Egyptian government – and still are today – because they were bombing judicial offices, assassinating the leaders of Egypt (including the 1948 assassination of the Prime Minister by a Muslim Brother followed by Egyptian security services killing Muslim Brotherhood founder Hassan al Banna on the streets of Cairo in 1949), attacking British soldiers and their families in Egypt, and plotting to overthrow the Egyptian government for not fully implementing sharia (Islamic Law). The MB built all of these organizations in the United States as they said they would, including the Islamic Teaching Center (ITC), Islamic Medical Association (IMA), Association of Muslim Social Scientists (AMSS), Association of Muslim Scientists and Engineers (AMSE), Muslim Students Association (MSA), Islamic Housing Cooperative (IHC), Muslim Businessmen Association (MBA), and many others before 1980. They continue to build them today to fulfill their objective – to create an Islamic State under sharia (Islamic Law). This is the same objective, by the way, of ISIS and Al Qaeda. What else are core Muslim Brotherhood beliefs as revealed in their doctrine? The Muslim Brotherhood logo is below. The Supreme Guide of the MB from 2010 until his arrest in 2013, Mohammed Badie, was sentenced to death in Egypt for inciting the revolution there among numerous other charges for which he has also been sentence to life in prison. If the self-evident information about the Muslim Brotherhood’s objectives and their guiding principles as stated by their leaders is not enough to ignite the brain cells in NPR’s reporters, UTT is not sure what will. The evidence in the largest terrorism financing and Hamas trial ever successfully prosecuted in American history (US v Holy Land Foundation for Relief and Development (HLF), Dallas 2008) was collected by the FBI during their 15 year investigation into Hamas in the United States and its front organizations. UTT readers are reminded that Hamas is an integral part of the Muslim Brotherhood – it is the Palestinian Muslim Brotherhood. The evidence in the HLF trial revealed, as NPR reported, there exists in America a massive Islamic network controlled primarily by the Muslim Brotherhood whose stated purpose is to wage “civilization jihad” to destroy America, overthrow it’s government and replace it with an Islamic state under sharia. This conspiracy includes all of the prominent Islamic organizations in America. The case was adjudicated in 2008 and HLF and its leaders were convicted for being terrorists (Hamas leaders). The last hearings on this matter were approximately one year ago so those who say HLF is “old news” are simply wrong or lying. 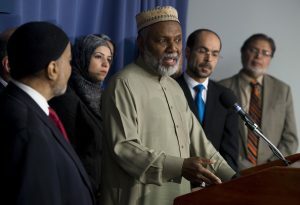 The HLF evidence, as confirmed by the Department of Justice filings, also reveal the largest Islamic organization in North America – the Islamic Society of North America (ISNA) – as well as the North American Islamic Trust (NAIT), are not only Muslim Brotherhood entities but directly fund Hamas, a designated Foreign Terrorist Organization, in violation of U.S. Federal Law. The HLF evidence also reveals, and the Department of Justice filings confirm, the Council on American Islamic Relations (CAIR) was created by the U.S. Muslim Brotherhood’s Palestine Committee which is Hamas in the United States. Did we mention Hamas is a designated TERRORIST organization? The leader/founder/board member of nearly two dozen of the largest Islamic organizations in North America was Abdurahman Alamoudi, who was a financier for Al Qaeda and now sits in federal prison. All of these are called “Investigative Clues” that the Muslim Brotherhood is “bad” and is doing “bad things” here in America – right now. The Muslim Brotherhood presents a clear and present danger to the United States and its citizens. The MB network in America should be disintegrated by the U.S. government and its leaders killed or captured. We can only hope the new administration will lay the hammer down on these suit-wearing jihadis. UTT continues to strongly encourage local and state law enforcement to ready themselves for dealing with this enemy at the local level. This requires a deep understanding of this problem for the law enforcement officer on the street who bumps into these jihadis on a daily basis. Designate MB as a terrorist organization and/or seditious. Enforce registration under FARA of anyone under the influence of MB or Islamic government. (Foreign Agents Registration Act, including university professors, imams, lobbyists, sharia-compliant bankers and the like). Use 18 U.S. Code Chapter 115 – TREASON, SEDITION, AND SUBVERSIVE ACTIVITIES as appropriate. Terminate immigration, refugee resettlement and reject asylees and VISA applicants that are sharia-compliant. Is that 50% or 99% of muslims? “Err” on the side of America. Root out and terminate foreign funding of universities, media and non-profits. They are at war with us–time we respond in kind. Thank you UTT for this excellent article. I laughed out loud when I read this final sentence to the NPR article, “”That process is parallel to every other group that’s come here,” she says. “The Catholics built their schools; they built their churches, their institutions. They created their organizations. The Jewish community did the same. I think we’re following along the same natural progression.” Ummm no, that is not the truth at all. Catholics were not busy beheading, crucifying, killing, burning, maiming, and demanding everyone convert to Catholicism or else. The NPR link did not let readers leave comments (at least that I could find) which was a shame. UTT readers may have been able to educate the clueless writer. One of the lead stories in this morning’s (3/28) Washington Times: “Trump backs off listing Muslim Brotherhood as terror group.” What on earth is going on here? The story implies in some Middle East countries the MB does service work, not terror. So what? Why not just list it as a terrorist group in the USA? Because the current administration is penetrated by pro-Saudi and pro-Sharia folks some of whom are establishment Republicans. Inasmuch as “weak links” controlling policy at top-leadership levels are more prone and more able than rank & file others to succumb to the allure of power & money, any quest for additional evidence of misprision of treason involving the Muslim Brotherhood and American media ought finally to include a confrontation with corporate owners against the background of irrefutable fact* which already exists, and with which – thanks to fifteen years of perseverance, and remarkable investigatory skills of the FBI in behalf of the American people, the largest global-Islamic-Movement terrorist money-laundering trial in U.S. history was successfully prosecuted, with criminal convictions, by a U.S. District Court in Texas and closed. *See evidence summary (readily available for public consumption per http://www.securefreedom.org) I.e. : GOVERNMENT EXHIBIT 003:0085/3:04-CR-204-G U.S. v. HLF, et al. Furthermore, a special prosecutor should be appointed by the Attorney General to investigate, with an eye toward prosecutions (and if necessary to arrange to put down by force) the on-going criminal rebellion involving “sanctuary cities”; collusively contrived court decisions clearly designed to usurp the President’s exclusive Constitutional prerogative to decide what steps he — AND HE ALONE – believes are needed to ensure national security and the enforcement of U.S. immigration laws, whether by federal & state juridical officials, governors, mayors, renegade police chiefs et al, or by anyone else he may choose to select. “The Constitution, and the laws of the United States which shall be made in pursuance thereof; and all Treaties made, or which shall be made, under the authority of the United States, shall be the supreme Law of the Land, and the Judges in every state shall be bound thereby, any Thing in the Constitution or Laws of any State to the contrary notwithstanding”. “The Senators and Representatives before mentioned, and the members of the several State Legislatures, and all executive and judicial officers, both of the United States and of the several States, shall be bound by Oath or Affirmation, to support this Constitution; but no religious Test shall ever be required as a Qualification to any Office or Trust under the United States”.